16 oz. plastic glow in the dark stadium cups are the perfect size for when you want a plastic cup that's a little larger and heavier. Have some fun at your next indoor or outdoor party with these plastic cups that glow in the dark. Keep your advertising message or logo in their hands. 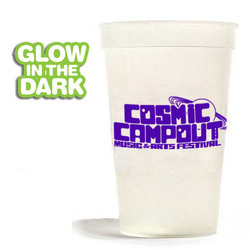 Printed plastic glow in the dark stadium cups are ideal for all promotional indoor or outdoor events, these plastic cups are reusable.